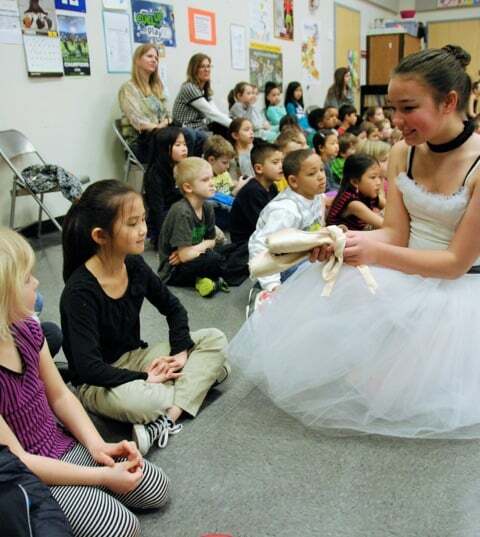 Outreach is an essential part of Emerald Ballet Theatre’s mission. 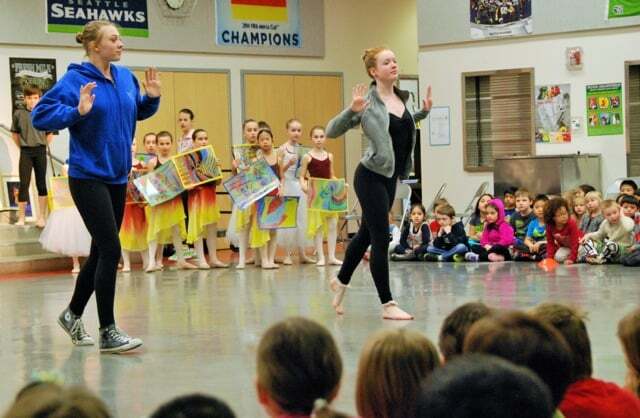 Each year EBT brings the magic of motion into the lives of thousands of children throughout the Puget Sound as students, performers, and audience members. We have three types of outreach programs: Assemblies, Workshops and Informances. Please download our brochure, then email info@emeraldballet.org for information on pricing and availability. Magic Bus programming is provided in Bellevue, Renton, Issaquah, and Seattle school districts, plus private schools. We would love to visit your community, too! Our 45-minute assemblies are conducted as an interactive “virtual field trip,” combining thematic performances by youth performers with audience participation. They are designed for large multi-age groups K-5 using “theater in the round” format at a school or community center. Rotating themes for assemblies include Visual Art (2019), Science (2020) and Storytelling (2021). Last year, during our Social Studies presentation, we were joined by special guest Chickadee Snow from the Blackfeet Tribe. We explored the Salish Sea landscape through time from the perspective of its original inhabitants. Spring 2019 will see the return of the VISUAL ART theme. Please contact us now for pricing details or to reserve your school’s assembly. In "Pictures at an Exhibition," we will take a virtual trip to a museum, learning about art and artists along the way. Watch, learn, take your turn! Our 60-minute workshops include a 30-minute active introduction to movement class guided by professional artists and assisted by youth performers. A 30-minute thematic performance follows during which the audience/students join in the presentation. Designed for smaller groups of K-2 or grades 3-5 at a school or community center. These typically take place during the summer. Informances occur two times per year at the theater in conjunction with an Emerald Ballet Theatre production. Participants watch a full-length performance (usually 1-2 hours), meet performers and choreographers, get a close-up view of costumes and sets, Q & A, and often have time on the stage themselves! A great follow-up or culminating experience after a Magic Bus Workshop or Assembly. The two annual informance options are The Nutcracker (in early December) and the Spring Production (in May). Interested in attending EBT’s Coppélia in May? Please email info@emeraldballet.org.